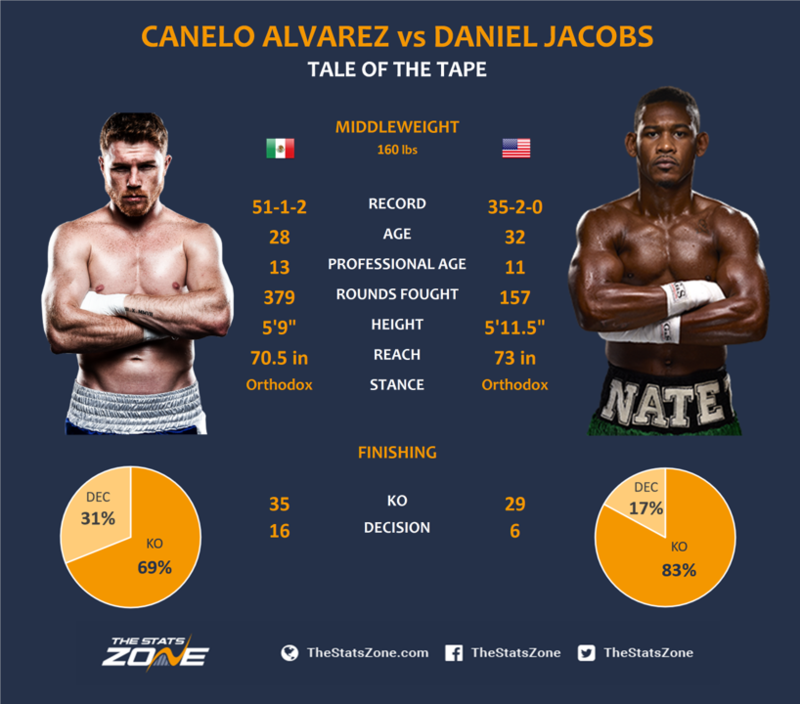 Are tickets still available for Canelo Alvarez vs Daniel Jacobs? Saul ‘Canelo’ Alvarez drops back down to middleweight to take up the next toughest challenge possible in the shape of current IBF middleweight champion Daniel Jacobs. Canelo puts all of his super middleweight titles on the line which, on paper, produces one of the biggest Boxing spectacles of the year. Both men are at the top of the game with a wealth of experience and only three losses between them out of their combined 91 fights. Canelo moves back down a weight class but one of the most important stats is Jacobs’ height and reach advantage. Giving up a reach advantage has not proved an obstacle so far for Canelo, with dominant wins over Julio Cesar Chavez and Rocky Fielding in recent fights, but Jacobs also has all of the skills to seriously trouble one of the pound-for-pound kings and this is why there is so much anticipation for this bout. 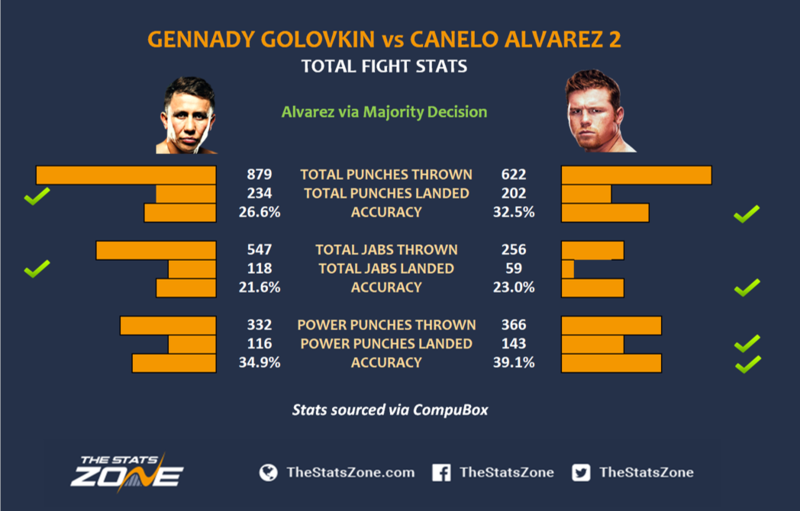 One draw and one loss courtesy of Gennady Golovkin has created the only blemishes in their last 10 fights and these results are the main reason why Canelo will be the favourite. All three of these fights were extremely close, with many disagreeing with the judges decisions. 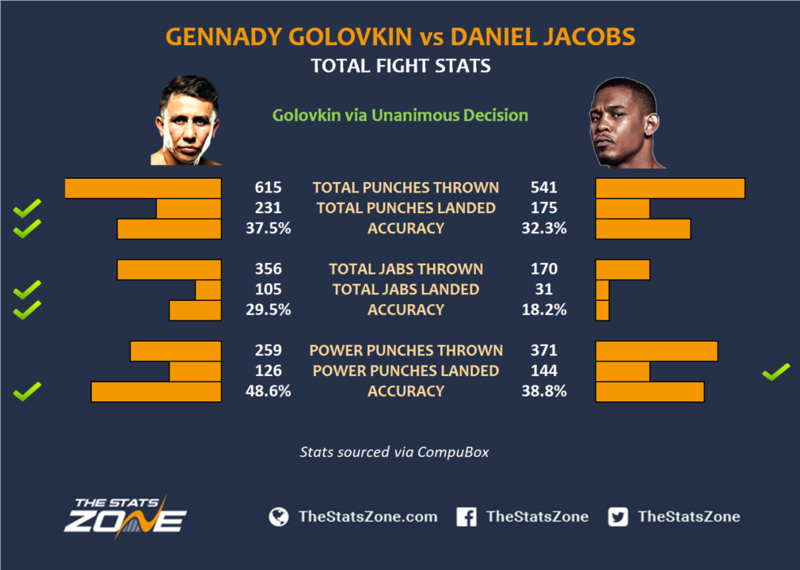 In March 2017, Jacobs' run of 12 consecutive finishes was snapped when he lost a unanimous decision to Golovkin and then in September the same year the Kazakhstani took on Canelo and fought to a very controversial draw with many backing Golovkin for the win. They met again for the rematch a year later where Canelo got the nod but this was also an incredibly close fight that split opinions. Ultimately, Golovkin got the better of Jacobs but not Canelo. 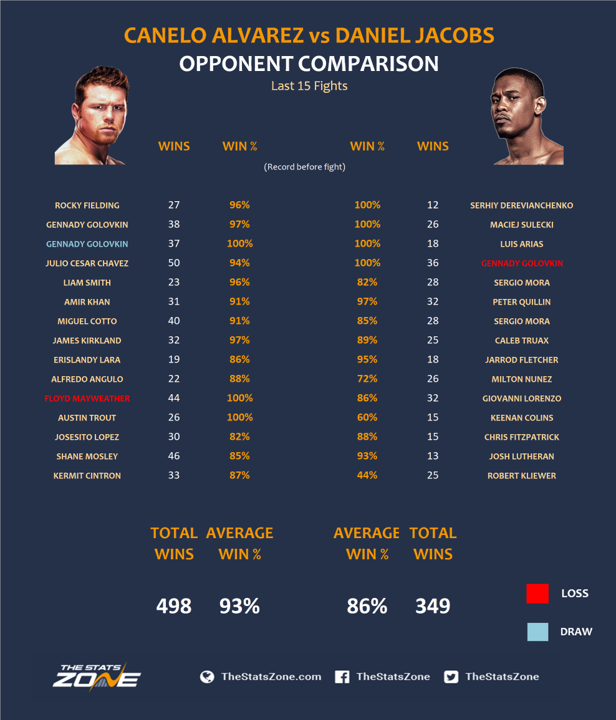 As you can see, Canelo has fought more experienced fighters and importantly, these opponents have had exceptional records with very few losses and better win averages compared to the opponents Jacobs has faced. 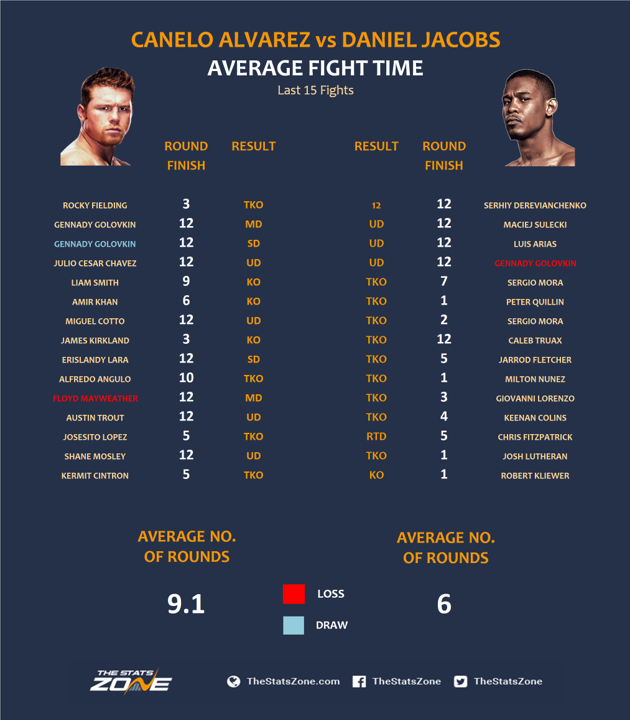 That said, in Jacobs’ last four fights he has come up against unbeaten fighters; with big wins over Serhiy Derevianchenko, Maciej Sulecki and Luis Arias. 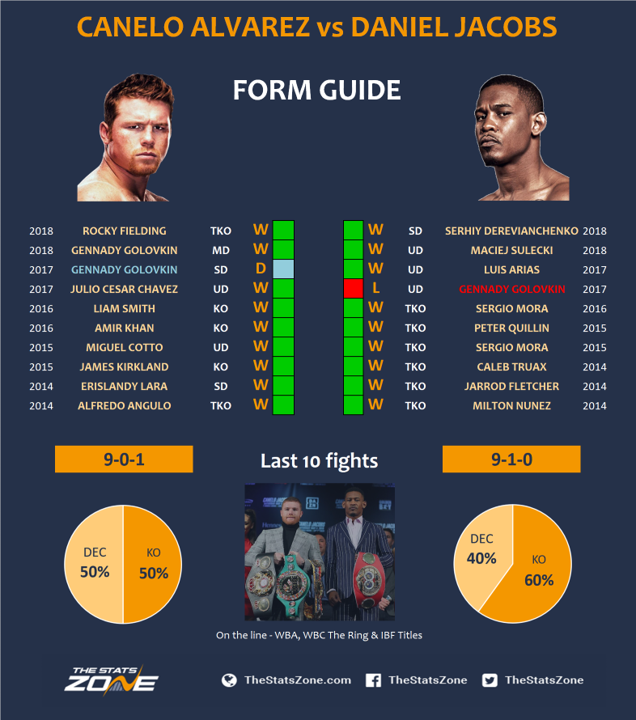 Canelo is the favourite, edging the important stats, but this is a different stylistic match-up for him and Jacobs will certainly provide one of the toughest tests possible for the Mexican. Jacobs is long, has lightening hand speed, great footwork and has the fight IQ to beat Alvarez but make no mistake about it, it will have to be his best performance to topple the decorated champion. Canelo is a complete fighter. His technique, knockout power, distance control and defence is a notch above and he is likely to come out with a game plan of waiting for Jacobs to commit, counter-punching him and then attacking the body which will be a large target. Jacobs will be well-aware of Canelo’s strengths and will look to keep the distance but maintain the pressure by constantly moving and popping his jab. Canelo is devastating at close range and this is where he could find the knockout. Jacobs on the other hand may not necessarily look for the knockout but try and break Canelo down and outwork him, waiting for any opening to put his weight advantage into power punches. How long is this fight expected to last? 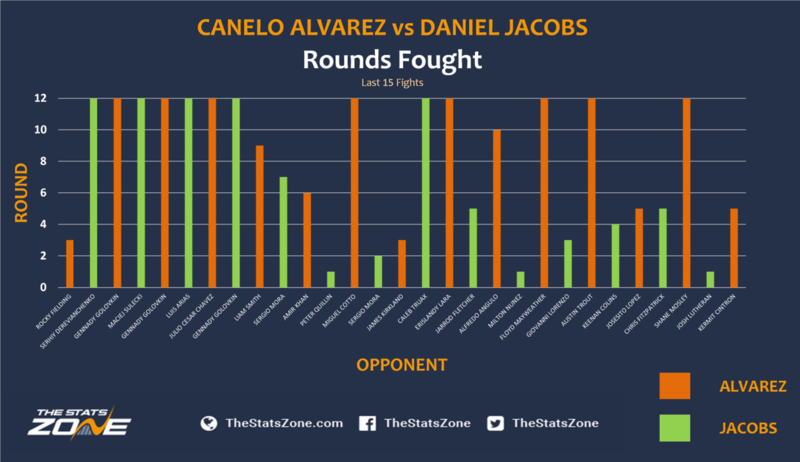 As you can see, Canelo spends more time in finding the victory, lasting over nine rounds on average, whereas Jacobs has found more knockouts in his last 15 fights with an average fight time of six rounds. 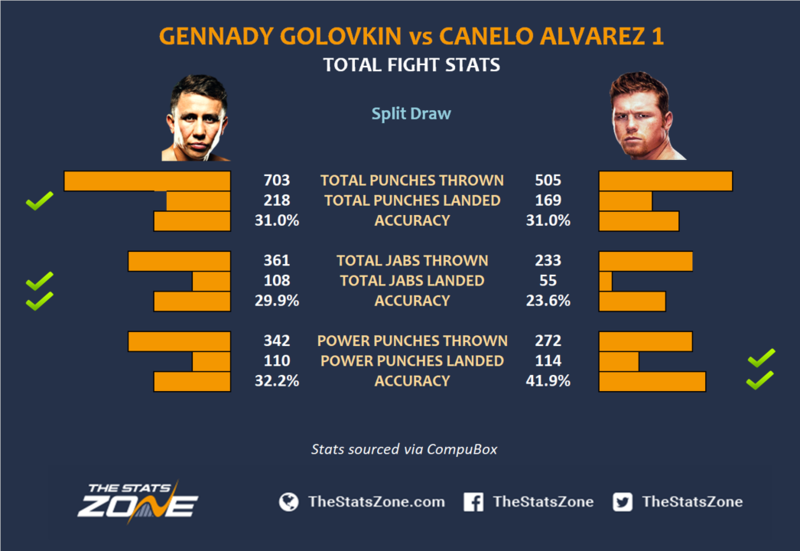 However, this difference is mainly down to the calibre of opponents Canelo has faced where his opponents are much harder to finish and if there is going to be a knockout, Canelo is more likely. If Canelo can land one of his ferocious counter punches or shots to the liver the fight will change course, but you can never count Jacobs out or doubt the will of the bone cancer survivor who proved even after getting knocked down by Golovkin early, he can come back and fight to the finish. If you also take into account how their recent fights have gone a decision is most likely but it will be a scrap and tough to call either way. Jacobs will not let Canelo settle but the Mexican does not seem to know how to lose and the longer the fight goes on, the more likely the judges will side with him.